In "Carcassonne", players place tiles to form a landscape with cities, cloisters, roads, and fields. Turn for turn, they expand the playing field according to specific rules, adding more and more terrain tiles. With their followers, players keep expanding their influence on the various areas in order to gain victory points. Followers can be used as knights or thieves, farmers or monks depending on the environment where they are placed. For example, a game token will represent a knight in a city, and a farmer in the field. Successful captures give the player more points, but the final outcome is only decided at the very end. 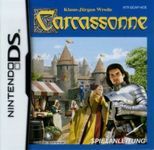 The player who scores the most points then is the sovereign of "Carcassonne".